Hand built with love in a cottage industry in Wisconsin. Will attracting bats to bat houses in my yard increase the likelihood that they will move into my attic or wall spaces? No. If bats liked your attic or wall spaces, they probably would already be living there. How many bats can potentially occupy my bat house? 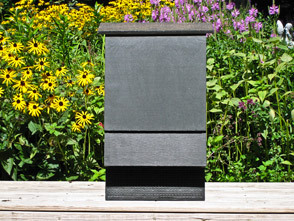 A common single-chamber bat house is capable of housing 50 bats, while a larger multi-chamber design can attract nursery colonies of 200 or more bats. How can I determine the likelihood of attracting bats? Throughout most of the United States and much of Canada there are occupied bat houses being used by one of North America's many crevice-dwelling bat species. Wherever bats live, they must find enough insects to eat, largely explaining their preference for roosting near aquatic habitats. The closer you live to cave or mine hibernating sites the better, and the existence of bat colonies in nearby buildings also increase your chances. Why might bats not be attracted to my bat house? The most frequent cause of failure is inappropriate exposure to solar heating. Alternatively, the kinds of bats that use bat houses may not be able to live in your area due to heavy pesticide use, inadequate food supply, or lack of available caves and mines within 50-100 miles. So far, we are unaware of large areas of North America (with the exception of hot desert lowlands) that cannot attract bats. If I have bats living in my attic, but would prefer that they occupy a bat house, what should I do? Attics and other parts of buildings often provide ideal bat roosting sites. In most cases, bats will not voluntarily move from an attic. In such cases, alternative roosts ideally should be provided several months or one season before the desired move. The bats should be evicted from the attic at a time in the early spring or late summer when flightless young are not present. Eviction is often easily accomplished. Watch to see where the bats emerge at dusk. Using polypropylene bird netting or heavy plastic, hang a large enough piece over the emergence point, extending a foot below and to each side of the exit. Secure the net in place so that it hangs free an inch or so away from the building. It will act as a one-way valve--permitting exit, but closing when bats land on it to return. How effective are bats in controlling insects? As primary predators of night-flying insects, bats play a key role in the balance of nature, consuming vast quantities of insects, many of which are costly agricultural and yard pests. Furthermore, many insects avoid areas where they hear bats. 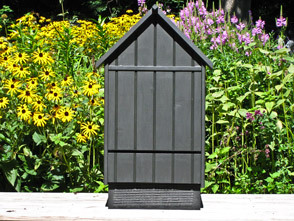 Will having bat houses in my yard interfere with attracting birds? No. They will not compete, either for food or space. Will bat droppings pose a threat to my family? No more so than bird or cat droppings would. You should avoid inhalation of dust associated with animal feces of any kind. What are the odds that a sick bat will endanger my family with rabies? Fewer than ten people in over 50 years have contracted rabies from North American bat species that commonly live in bat houses. 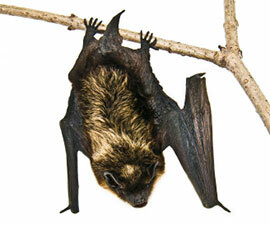 Like all mammals, bats can contract rabies, though very few do (less than half of one percent). Unlike many other animals, even rabid bats rarely become aggressive. They quickly die from the disease, and outbreaks in their colonies are extremely rare. The odds of being harmed by a rabid bat are remote if you simply do not attempt to handle bats. Any bat that can be easily caught should be assumed to be sick and left alone. We do not recommend attracting bats to places where curious children are likely to attempt handling them. With or without bats in your yard, the most important action you can take to protect your family from rabies is to vaccinate your family dogs and cats. Download mounting instructions for either poles / posts or on buildings. Used with permission from Bat Conservation International. My bat house arrived last week. You were right, it was easy to hang. We purchased a bat house from you at the Farmer's Market. I've seen a couple of commercially made bat houses, they are not near the quality of yours. Good luck! Sometimes bats find their way into classrooms and offices in our older campus buildings. Our Honors class recognized how important it is to coexist with the bats and adopted their cause as an eco-project. 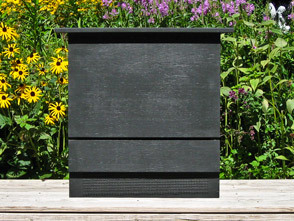 We held a fundraiser "Bat House Party" so that we could buy artificial roosts from BestBatHouses.com. Now we can safely exclude the bats from our attics and still encourage them to stay on campus and eat our mosquitoes! We are impressed with the quality of our new bat houses! Feel free to Email or call me (between 8 am and 8 pm) about placing or checking on an order.